A one or two- day trip by dune buggy or 4X4 vehicle, up to the border with Ceará, is a perfect way to enjoy it. A series of fishing villages lie along the 250 kilometers (155 miles) of coastline. Each hamlet has semi-deserted beaches, dunes, cliffs, and calm seas dotted with jangadas (sailing rafts) or boats. Among these villages are such gems as Touros, São Miguel do Gostoso, Galinhos and Ponta do Mel. The last, which is nearly at the Ceará border, is on the so-called Costa do Sal (Salt Coast) or Pólo Costa Branca (White Coast Center). The monikers refer to the salt works concentrated in the area, mostly around Mossoró, Macau and Areia Branca, where about 90% of Brazilian salt is produced. This town owes its name, which means "bulls," to a rocky formation on the beach that resembles a bull's head. Touros, 88 kilometers (55 miles) north from Natal along first the BR-101 and then RN-221 highways, has the best traveler-oriented facilities along the North Coast. It oilers beaches – namely Carnaubinha, Praia do Farol, Praia da Gameleira, Garҫas and Perobas - that have calm seas, coconut groves and cliffs, quaint houses on the coast, and rafts dotting the water. Perobas is the place for diving on coral reefs. At low tide, motorboats makes two-hour runs for snorkeling on a long stretch of reef. Farol do Calcanhar, a 65 meter tall (213-foot) lighthouse built in 1943, is the tallest in Latin America. The base is 9 meters (30 feet) above sea level. The 298-step ascent is permissible only on Sundays, but those who time their visit right will enjoy a wonderfully contrasting view: on one side, deserted beaches, the town of Touros and the infinite ocean; on the other, towards Ceará, a stretch of untouched nature in shades of green and brown. In the latter direction, beyond a curve (the "calcanhar”, ankle) of the Brazilian coastline, the climate and vegetation typical of the semi-arid Northeast begins. According to a legend, perhaps apocryphal, this village, 105 kilometers (65 miles) north from Natal, took its name from a legendary local character, whose laughter was infectious and delightful (gostoso). Whatever the origin, it is a very pleasant village indeed. The flow of travelers from Natal, 105 kilometers (65 miles) to the south, has not changed the routine of fishing, labirinto lace making and manioc flour production. Sitio Caldeiro, the village's original dwelling and now a guesthouse, stands at the town center, along with tiny Praҫa dos Anjos square. Anyone visiting São Miguel do Gostoso between August and January, during the so-called "farinhada" (flour making process) period, can drop by the twenty-some casas de farinha (manioc flour mills), which shows the traditional, small-scale production of coarse manioc meal (farinha) and of the starch used to make tapioca. The beaches on this part of the coast are still relatively unspoiled. They have calm waters, just a few summer homes and rafts, and fringes of sparse, low-lying vegetation. Dune buggies can be used to explore at low tide. Praia de Ponta do Santo Cristo is the best windsurfing beach, and the elite at Praia de Tourinhos are beautiful. At Praia do Marco, where the early Portuguese once erected a landmark called the Marco de Touros, you can now see a crude copy of that symbol of territorial possession. The original Marco de Touros is now in Natal. Take the BR-101 highway north from Natal, passing by Touros, and then the RN-221 state highway toward São Miguel do Gostoso to the turnoff onto a well-marked road to São Miguel do Gostoso. Schools of peixe-galo, the fish after which this town is named, have no trouble finding their way to this riverside spot. But human visitors will find the trip to be something of a daring adventure. 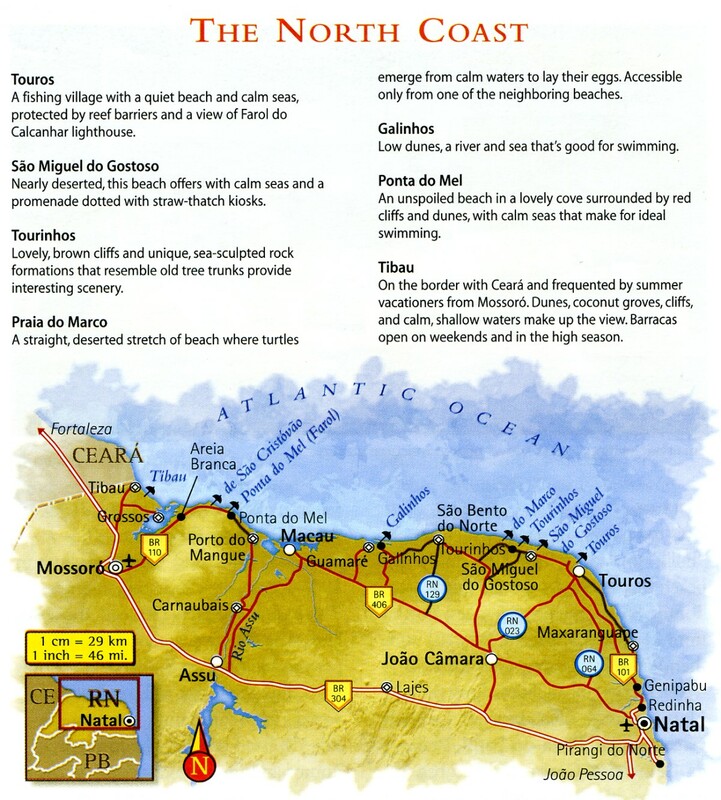 Tiny Galinhos is 175 kilometers (109 miles) north of Natal, and to reach it one has to drive first along the BR-406 highway and then down the RN-402 state highway. You'll need a dune buggy or 4X4 vehicle to navigate the roads' potholed stretches. Vehicles are not allowed into the village; drivers leave them parked on the banks of the Rio Pratagi, which they cross by boat. On the other side lies an enchanting, picturesque peninsula. Donkeys and carts are the only vehicles to ply the sandy streets, locals run simple guesthouses, and a TV in the middle of the square plays all evening. The village beach, on a stretch of low lying dunes, is relatively calm and good for swimming. During motorboat trips around the Pratagi, Aratuá, and Rio do Capim rivers, visitors can enjoy the botanical riches of the mangroves, the small freshwater island beaches and white mountains of locally mined salt. The houses of this simple village run from the top of some reddish cliffs down to a largely deserted beach. Anyone on top, where Farol da Ponta do Mel lighthouse sits, has a spectacular view of the cliffs, dunes, and ocean. The landscape here, 355 kilometers (220 miles) north of Natal, consists of caatinga vegetation, with cacti such as mandacarus and bromeliads such as macambiras. The town's name alludes to the production of wild honey (mel) in the Serra do Mel range, which is close by, but the most evident form of husbandry is raising goat and donkeys. It is well worth extending the trip to visit to watch the sunset from Praia de São Cristovão, a wonderful and almost-deserted beach. A regular car can reach Ponta do Mel by driving northwest along the coast on BR - 110, but a 4x4 vehicle can take BR-304 to Porto do Mangue, then cut across the dunes on a lovely stretch of sandy road. The second option demands care; there are no signs or gas stations. It's essential to fill up with gas before you set off. A little before Ponta do Mel, you can find Praia do Rosado (Rosy Beach), a name that refers to the pinkish shades of the dunes. Enjoy this spot as evening approaches, when the pink tones of the dunes mix with colors of the sky, in an unforgettable spectacle.